Traffic, along with weather, will be the chief challenges for people wanting to see the total solar eclipse. 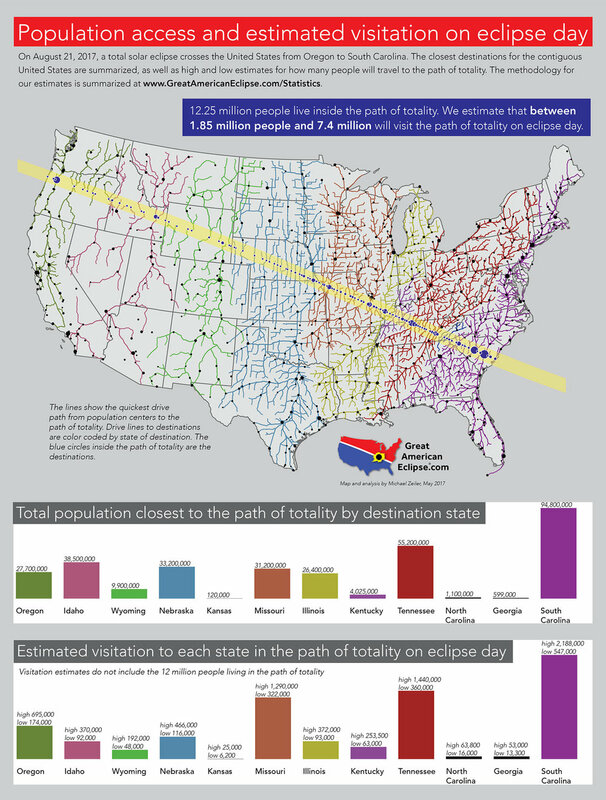 I analyze how the US population is distributed with respect to the US road network and the path of total solar eclipse to predict how many people will visit the path of totality and the resulting traffic congestion. Using advanced ArcGIS.com software by Esri, US Census data, and a road network model of every street in the USA, I present estimates for where people will gather for the eclipse and in what numbers. The coming total solar eclipse of August 21, 2017 is widely called the Great American Eclipse because it will be so accessible to so many millions of Americans. A total solar eclipse is easily the most spectacular sight in nature when the sky suddenly darkens and the most beautiful object in the sky — the Sun's shimmering corona — becomes visible for two minutes or so. To see a total solar eclipse is an intensely emotional experience and a memory for a lifetime. The path of totality cuts a diagonal path across the nation from Oregon to South Carolina and most Americans live within a day's drive to the path of totality. The United States has an excellent highway system and most American families have it within their means to take a short driving vacation. August is an ideal month for a vacation; the weather is warm and the chance of summer storms has diminished in much of the nation. 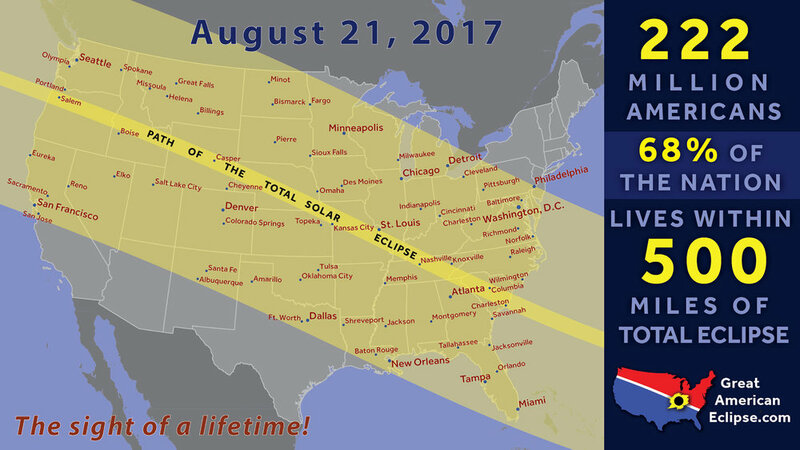 Most schools have not yet begun their fall session by August 21st and some schools near the path of totality are scheduling a late start. 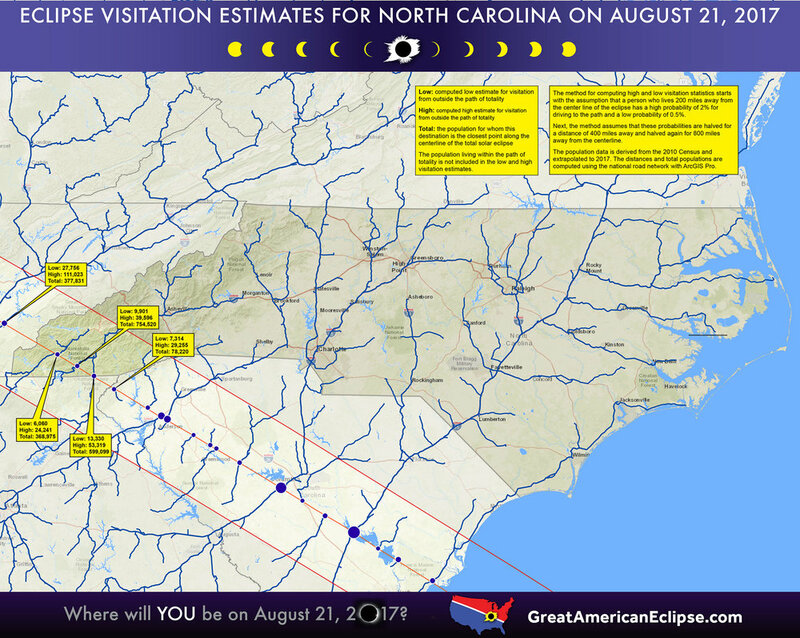 Social media will have a huge impact on motivating eclipse visitors. The eclipse is exactly the type of event guaranteed to go viral on Twitter, Facebook, Instagram, and other social platforms. 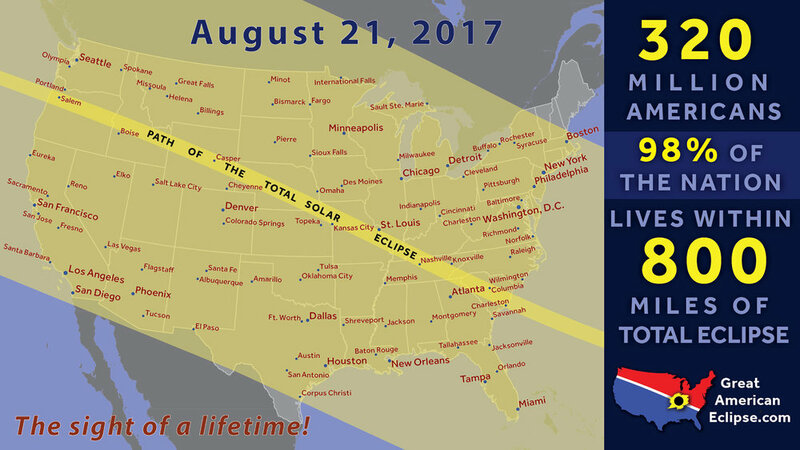 We expect that many people will only make plans to go in the week before eclipse day. The accessibility of the August 21 total solar eclipse is simultaneously a great benefit and a problem. The benefit is that for so many millions of Americans, nature's grandest sight — a total eclipse of the Sun — can be seen by packing a tent and sleeping bags and taking a short road trip from home. To see the stunning spectacle of totality, you have to be within the 60 to 70 mile wide path There is plenty of room inside the path, provided people distribute themselves well. The problem is that these millions of Americans will produce predictable traffic congestion. Imagine 20 Woodstock festivals occurring simultaneously across the nation. 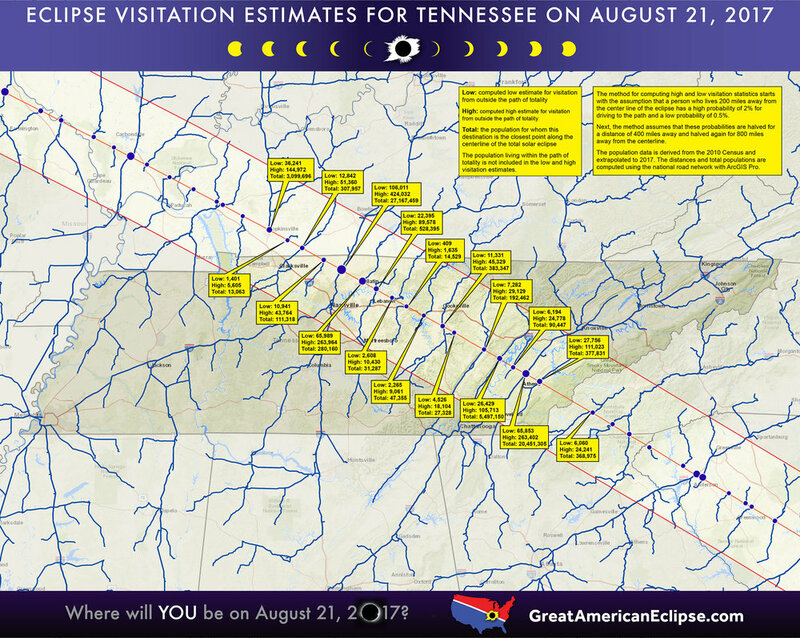 Large numbers of visitors will overwhelm lodging and other resources in the path of totality. There is a real danger during the two minutes of totality that traffic still on the road will pull over at unsafe locations with distracted drivers behind them. Despite this, we urge you to make every effort to travel to a spot inside the path of totality. You will be stunned at the apparition of the Sun's corona, the majestic light show in the sky, and the full sensory experience of totality. You will remember this sight for the rest your life and will never regret the effort to see totality. Arrive to your viewing location at least one (and preferably two) days in advance of August 21st. 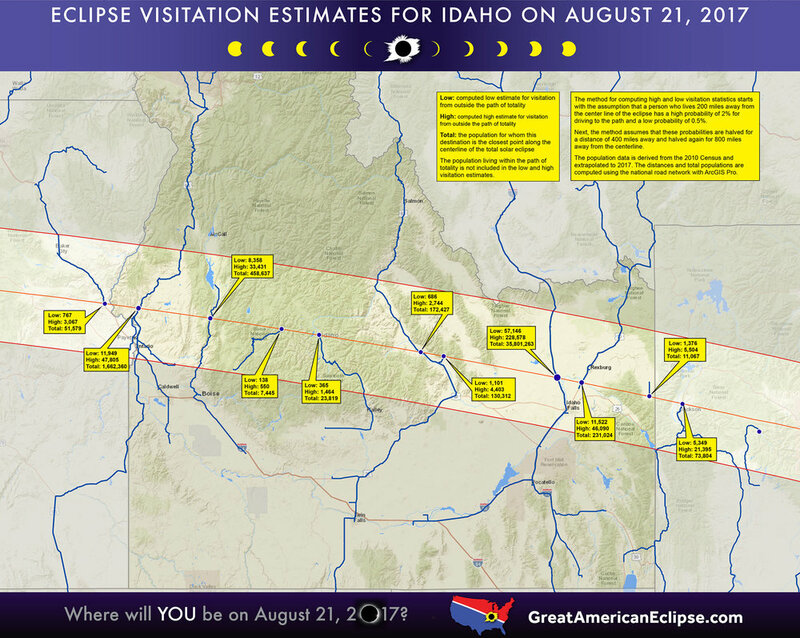 Some interstate highways in or near the path of totality will be parking lots on the morning of the eclipse. Avoid the areas of peak congestion as shown on these maps. Check our eclipse web app for real time traffic data. If you have not yet secured lodging, plan to camp or take an RV. There will be plenty of temporary campsites on farms and empty lots. If you have the freedom to travel long distances, the western states from Oregon to Nebraska offer better odds of clear skies and less congestion. Be as self-sufficient as possible. Keep your gas tank topped. Bring water, food, and toilet paper. Don't forget sun-screen and hats. If you absolutely must stay in touch with family or work, rent a satellite phone. Cell phone systems may be overwhelmed. Get eclipse glasses now before shortages in August. They are needed to watch the partial stages of eclipse but you can view totality directly with your eyes. Learn how to safely view the eclipse. 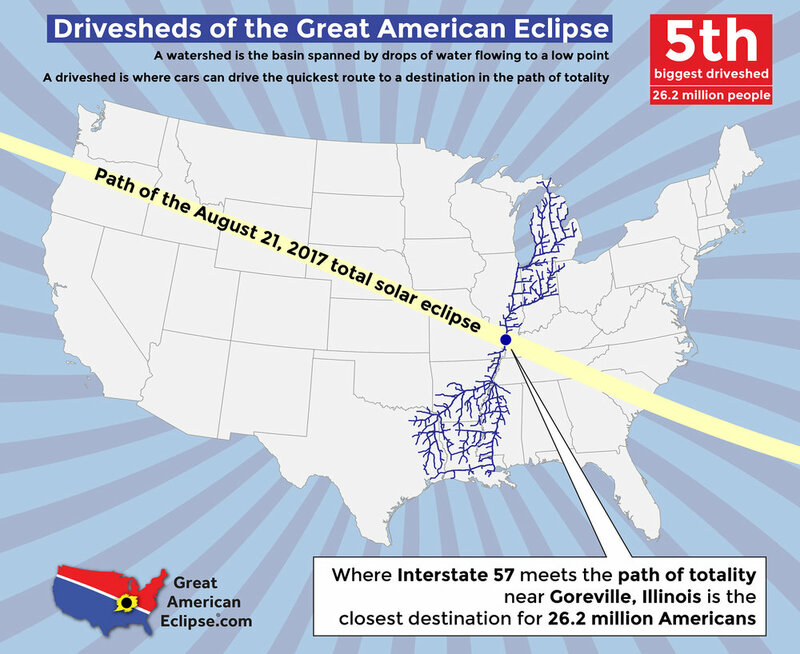 Get good eclipse maps of the path. These will be invaluable if you need to relocate and will make a great souvenir of the event. Watch the weather report on your local TV station in the days before the eclipse. Broadcast meteorologists will be giving eclipse weather forecasts. Try to relocate to another area if your target destination has a poor weather prospect. This infographic summarizes the quickest paths to the eclipse from throughout the nation along with estimates of eclipse visitation. Clearly, the state with the greatest impact on eclipse day will be South Carolina. It is the closest destination for the entire Eastern Seaboard. Other states with major impacts will be Tennessee, Missouri, and Oregon. A person who is 200 miles away from the centerline of eclipse will have certainly heard about the eclipse within the week before from TV or social media. This average person will receive the impression that the total solar eclipse is something very special to see. Not every one has the freedom to travel. Monday is a work day and for some, a school day. Some may also be deterred by myths about viewing the eclipse or scary stories of traffic congestion. Despite the many news stories about the spectacle of the eclipse, some people will be completely disinterested in the eclipse. Based on this profile of an average person living 200 miles away, I estimate that this population has a high probability of 2% to drive into the path of totality and a low probability of 0.5%. I halve these estimates for people living 400 miles away. I further halve these estimates for people living 800 miles away. I apply this formula to every populated area in the United States using ArcGIS software by Esri. 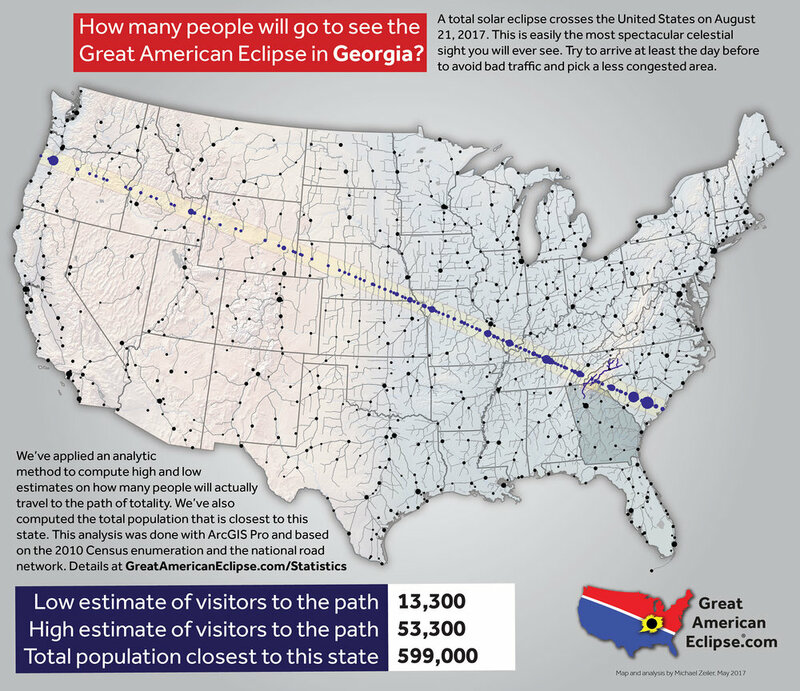 The sum estimate from this analysis is that between 1.85 and 7.4 million people will visit the path of totality on eclipse day. The impact of social media might be extreme and visitation might possibly be greater than estimated here, especially from nearby metropolitan areas such as Portland OR, Boise ID, Salt Lake City UT, Denver CO, Lincoln and Omaha NE, Kansas City and St Louis MO, Chicago IL, Indianapolis IN, Cincinnati OH, Chattanooga TN, Atlanta GA, and Charlotte NC. Poor weather will depress eclipse visitation in areas obscured by clouds. Some people will relocate to another state with better weather prospects. Another risk is smoke from wildfires in the American West which may affect large regions and force eclipse visitors east or west. Some large events will capture regional visitors. 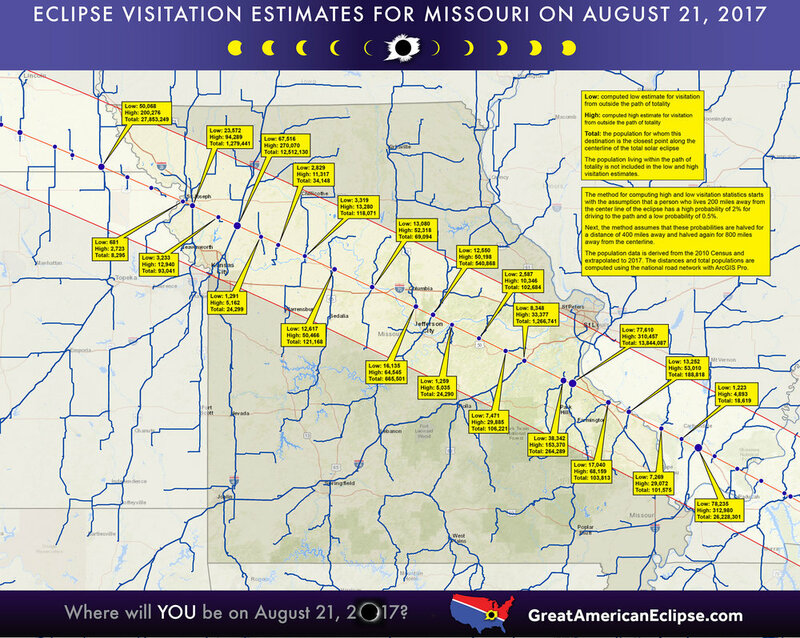 For example, a very large eclipse viewing event at St Joseph MO will draw visitors from Kansas, Nebraska, and nearby states. We do not attempt to model the number of people driving from Canada or Mexico, flying from within the United States, or arriving from Europe, Asia, or other international regions. It is more difficult to model these types of travelers and we don't believe they will substantially alter these estimates. This map shows how many hours it will take to drive from your location to the path of total solar eclipse. Note that this map shows travel times for a normal traffic day. Because August 21st is a Monday, you should head for your destination on the prior Saturday or Sunday. While we expect major traffic on eclipse day, we expect traffic to clear in many locations by the evening of eclipse day or the day after. Keep in mind that while traffic will be severe on the morning of the eclipse because cars are converging on popular destinations, cars returning home on Monday evening or Tuesday will be dispersing to various destinations across the nation and traffic will gradually ease. Click this map to enlarge. This map was computed with ArcGIS Pro by Esri. First, a series of destinations where highways intersect the center line of eclipse were digitized. A series of quickest routes were computed for all significant cities. Next, drive time polygons were computed showing the drive time distances based on the US road network. Mexico was not included because mexican road network data was not available. 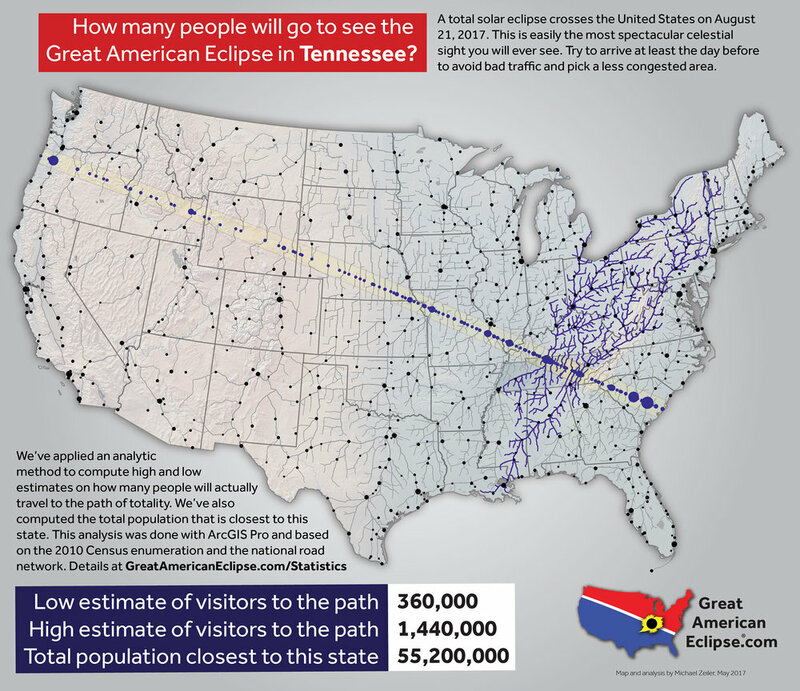 This map gallery shows the proximity of the American population to the path of totality. 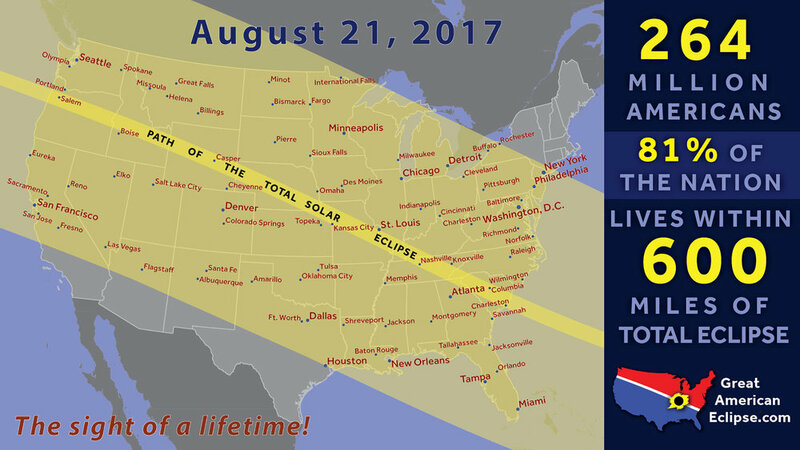 12.2 million Americans live inside the path of totality, over half the nation lives within 400 miles of the path of totality, and 80% of Americans live within 600 miles. The key to the widespread accessibility for this eclipse is the fact that this the path traverses the nation from the Pacific Ocean to the Atlantic Ocean. The last total solar eclipse to cross the United States from coast-to-coast was 99 years ago in 1918. Use the navigation buttons on the left and right sides of the gallery to see all 10 population proximity maps. These maps were computed in ArcGIS by generating buffer areas at 100 mile intervals, loading 70 million Census block points from the 2010 enumeration, selecting points within each buffer area, summing the population values, and extrapolating to 2017 population values. Drivesheds are a useful way to estimate and visualize where the traffic chokepoints will be on eclipse day. This gallery first shows a summary of all the drivesheds to the path of totality, followed by the top 12 drivesheds. Tip: Avoid Santee, South Carolina on the morning of August 21st. Use the navigation buttons on the left and right sides of the gallery to see all 13 driveshed maps. 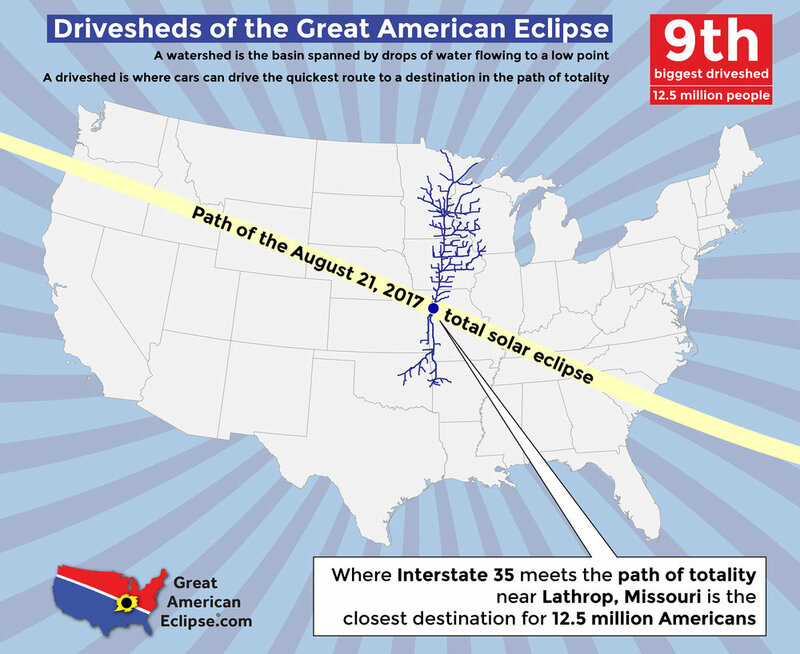 Note that there are a total of 14 states touched by the path of totality, but because tiny corners of Montana and Iowa barely touch the path of totality, no signification visitation will happen there. 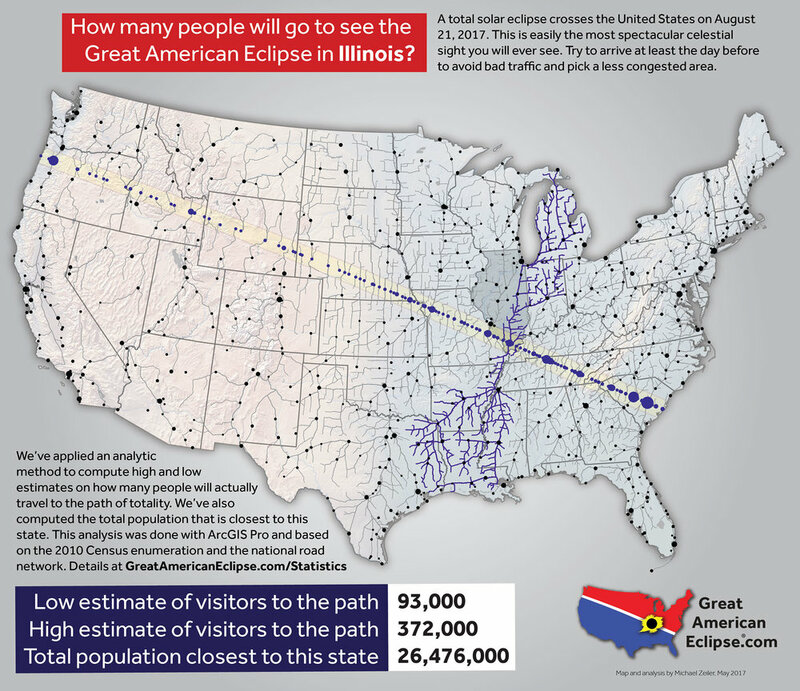 This map gallery gives estimates of how many people will visit each of the 12 states through which the path of totality passes. The total population which is closest to this state is also given. The low and high estimates start with our assumption that an average population living 200 miles from the centerline of eclipse has a high probability of 2% of driving into the path for eclipse day and a low probability of 0.5%. Estimates for visitation from population centers further away are reduced proportionally. Use the navigation buttons on the left and right sides of the gallery to see all 12 state visitation estimate maps. This map gallery gives estimates of how many people will visit each of intersections of highways and the center line of eclipse. These maps are especially useful for local planners such as police, emergency responders, convention and visitor bureaus, and state and local authorities. 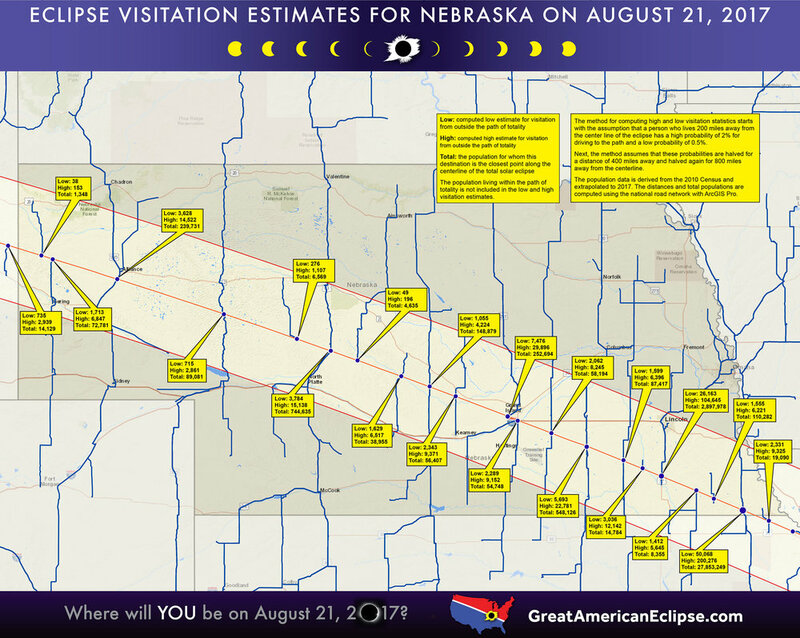 These maps note the assumptions made and actual visitation may vary due to factors such as weather, congestion, regional eclipse viewing events, and how the regional population responds to broadcast and social media reports on the eclipse. Click to see enlarged maps. The maps and infographics on this page are the result of considerable analysis applying ArcGIS Pro and ArcGIS.com software by Esri, the leading GIS (geographic information systems) company. The data used were the 2010 Census enumeration at the block level extrapolated to the 2017 population and the detailed road network GIS layer within ArcGIS.com. Michael Zeiler has chased total solar eclipses around the world since 1991 and operates two websites, GreatAmericanEclipse.com and eclipse-maps.com. Michael is an employee of Esri and writes documentation on geographic data modeling. Michael has worked in the GIS industry for 33 years. 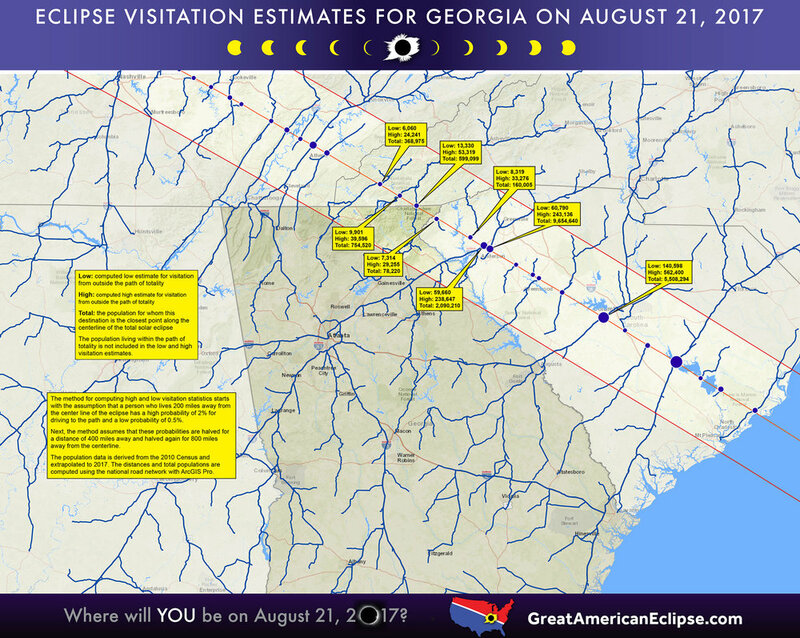 The maps and graphics on this page may be used in broadcast, print, and social media provided that a live link or print credit to GreatAmericanEclipse.com is given. 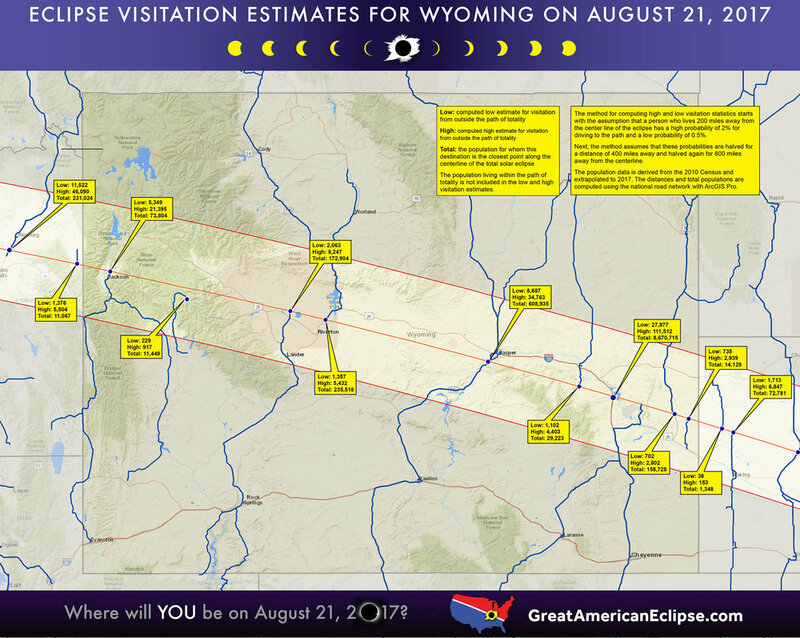 Email greatamericaneclipse@gmail.com if you need high-resolution maps.